A. Activity Feed: Chronological feed of activity in the account. 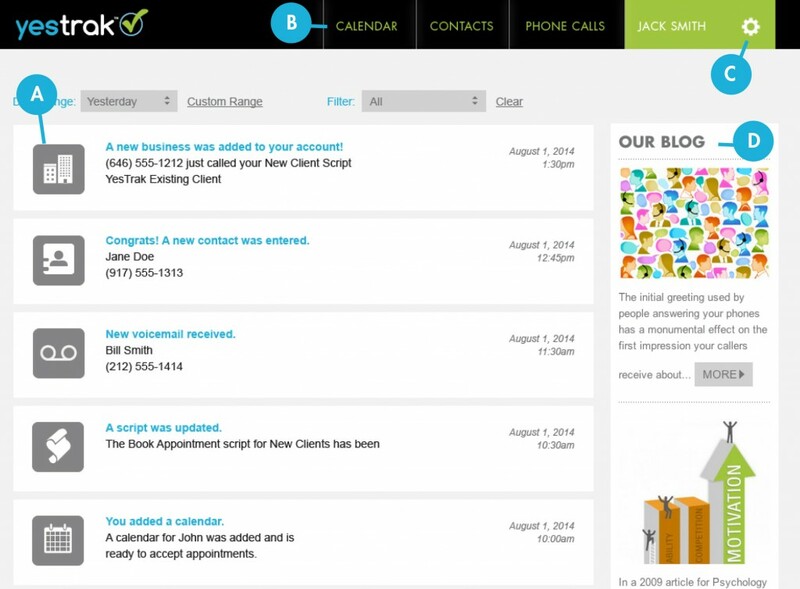 Anything from “adding a script” to a “call received” or an “appointment booked” can be viewed at a glance. B. Navigation Bar: Click on the navigation tabs at the top of the page to access calendars, contacts, recordings and calls. C. Settings Tab: View and change account settings under the gear icon: Businesses, Scripts, Calendars, Contacts, Recordings, Menus, Voicemail, Users & Billing. D. Blog Feed: Recent blog entries from YesTrak.